There are things that people can come back from, but cannibalism has to be where some draw the line. Like this was a truly dark turn that the people in the bunker had to take, and it is terrifying to observe how everyone got to that point. "The Dark Year" written by Heidi Cole McAdams, was an episode that was absolutely chilling to experience and it changed the way that some characters are now seen in our eyes. It was a necessary evil to explore to its fullest, and yet it is something that no one can completely recover from. At its core, the decision to include cannibalism was a bold one, not only because of how taboo the topic is but also because the risks it presents for several main characters. The divide between Octavia and Abby is clearer than ever, with Abby specifically exposing her role in a haunting decision that makes it really difficult to digest. The idea of consent transcends a casual definition when you consider how much of that was taken away in this case for what seems to be the greater good. But The Dark Year questions just that through the lens of Abby's strong belief and Octavia's relucent trust. What is the line between looking out for loved ones and dooming them beyond repair? Abby and Octavia are at the forefront of the question, both choosing to take away the choice of consuming human flesh for the sake of survival. As always on The 100 though, nothing is as easy to judge, especially in such a high stake situation. Still, that doesn't take away from the fact that these flashbacks really changed the way some evolutions were introduced at first this season and the accountability that some must face. During The 100 Season 5 Episode 11, Abby examines once again that way that she had to convince Octavia to make sure Wonkru engaged in cannibalism for their own survival. This opened the door for another massacre, with Octavia traumatically killing those that wouldn't agree to engage in such a sickening act. Meanwhile, those marching and those in Shallow Valley are all in different positions trying to figure out peace for the sake of McCreary's chaos. 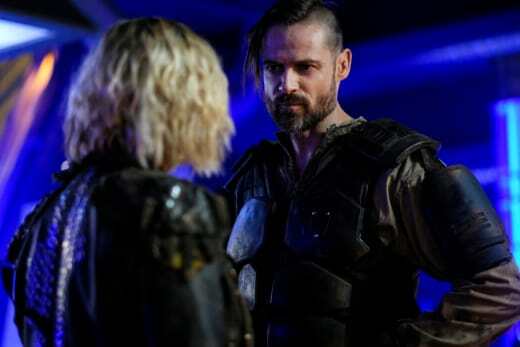 Charmaine and Kane try to work together with Bellamy and by extension a reluctant Octavia to create a plan that would keep McCreary from gaining the upper hand. Also, Raven and not Zeke kissed. Yet even that little light didn't prepare anyone to figure out how to process The Dark Year or where things will go from here. McCreary is one of many that are caught confused by the change of plans, with Kane creating a true cliffhanger. There really aren't many words that can explain the initial reaction to the way that cannibalism was introduced on the show. First of all, people eating the remains of other people was very much a thing that happened and that many of us picked up on early in the season. The way that it happened though, nothing could have prepared us for the fact that it was Abby that not only pitched but that created the reinforcement for it. Now, the important point in all this is that both Abby and Octavia suffered from this bone-chilling decision, and it is something that still haunts them. But, there is also the discussion about the choices that were made leading up to and following The Dark Year that matter in all this too. Abby saying that she can't lose Kane, and from that convincing Octavia that he had to be involved in this when he clearly didn't want to is a very clear parallel to Kane's decision about Abby and the bunker. During The 100 Season 4 Episode 12, Abby made it clear to Kane that she didn't want to be kept in the bunker. She had made the decision to make room for someone else and she expected Kane to respect that even if this was something he couldn't live with. But Kane couldn't live without Abby and he chose to face her anger as long as she stayed alive. Abby was put in a very similar position, one that we can't forget was also influenced by her addiction, in which she told Octavia that she couldn't lose Kane. And which these two went through the same inner turmoil to protect their loved ones, does that excuse the fact that they knowingly went against the other's request? Cannabilism as a last resort to survival is heartbreaking and frankly, there is no way even I could know what I would do in that situation. 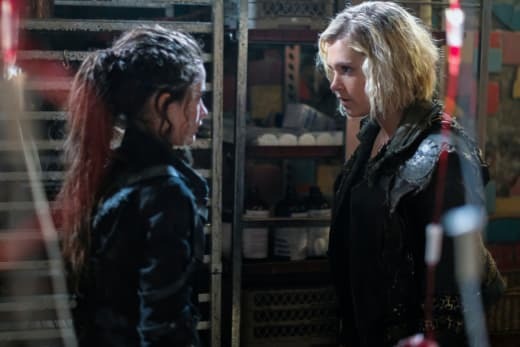 Choosing to commit such a dark, terrifying, and inhuman act for the sake of staying alive is something that The 100 explores well because it puts you in that position where there is no right answer. Abby is caught in that conflict, and yet there needs to be a discussion about the fact that consent was taken away from not only Wonkru but from someone, she cared about. We thought we should let you know that you killed your own people. Enjoy your walk. Permalink: We thought we should let you know that you killed your own people. Have fun on your walk. Struggling to let go of someone you love is terrible, but that doesn't mean that ignoring their wishes is the right way to go about it. Kane made it very clear that he didn't want to eat other people, he refused it until it was other people's lives at stake and it was up to Abby to be in his corner. She doesn't shoulder all the blame but she isn't innocent in all of this, even at the simple basic fact that she cursed someone she loved to do something he expressed explicitly that he couldn't go through. I love you, Clarke. But we are on the wrong side of this war. Permalink: I love you, Clarke. But we are on the wrong side of this war. Having a choice is important and in the bunker, they were very limited in that, but when it comes to living or dooming yourself, there has to be that awareness that not everyone wants to just survive. Similiar to Jasper's words in Season 4, he didn't want to just survive and constantly fight for that right to live at every turn. This was a hard limit for Kane, and rightfully so. Abby not taking that into consideration is even more startlingly because of the act itself. Experiencing Kane asking Abby to be kept inside the bunker is very different from Abby convincing Octavia to make sure Kane ate human remains. The image is more grotesque and the uneasiness comes with the cannibalism territory. Now all of this doesn't mean Abby deserves to be punished for it, by the look of it this is when her addiction truly spiraled because all she did was blame herself. The narrative doesn't leave any room for doubt about how much Abby has made herself pay for what had to be done so that they wouldn't watch everyone die from no real nourishment. There was no easy way to take on eating the bodies from the fighting pits but it had to be done for them to make it those six years. It was the method that left a lasting mark on everyone that had a role in that cafeteria scene. Still, Abby is suffering from that choice and that needs to acknowledged. But Abby still made that choice and she isn't the only one who has to live with it, Octavia being the other example of someone who suffered greatly by this decision. During The 100 Season 5 Episode 2, Octavia had already reached a dangerous point within herself. She wasn't exactly innocent in the way that she chose to implement those fighting pits in the first place. But The Dark Year shed a light on the fact that humanity didn't leave Octavia shortly after that. She was still actually looking out for Wonkru, unlike now in present time when she chose to burn their chance at another life just because she wanted to march to war instead. Back then, Octavia was taking into consideration the state that this would leave the others in and that wasn't something she could just wave away in the name of survival. Giving Wonkru a choice still meant something to Octavia, which is a fascinating place to explore her true descend into this version of herself now. At Abby's encouragement based on what had to be done on the Ark before, Octavia was forced to take that final step that wrecked her to a point that now seems almost unreturnable. Octavia committed that brutal massacre in the most emotional but also ruthless ways, she couldn't lose her people so she chose to lose a few along the way to keep the majority alive. Directly mirroring Abby's choice to force cannibalism for the sake of living, Octavia was the hands to Abby's words. This isn't meant to be blaming someone for this atrocity, because the true horror is that moment when everyone felt like they had nothing else to do to stay alive except to eat people and know that they had no escape from this for years to come. But Octavia's actions definitely don't go unspoken of, because much like Abby she made a decision of taking that exact same thing away from others. Both Abby and Octavia set into action something that can't be undone, and we have reached a point where there is nothing that could make any of this okay. Abby and Octavia caused suffering and made decisions that can't be forgotten, but they have also clearly continued to have that weigh on them even now. This guilt came about in the form of an addiction that Abby is anchored to, one that has led her half to death because of what she did and how it manifests in her life since then. For Octavia, she put herself in the position that she now can't unhinge from, very similar to an addiction but this one is more about control. In a way, Octavia refuses to let go of power because she is trying to prevent the spiral that she ended up losing all of herself in. This is a complicated situation all around, it is one that was shown to the audience to shape their understanding of where these characters are at now. This can't be changed because this suffering was hanging over these people for years. And yet, it feels fresh to the audience and there is no easy way to move away from what Abby and Octavia had to do. For now, all that can be said is that these heartwrenching choices that Bellamy and Clarke did for the sake of their people are now thrust into the hands of Abby and Octavia. Their choices aren't crystal clear, there were other options and that is the real weight that won't go away. It is messy and upsetting and unsettling on all fronts. The what ifs are almost as terrifying as the cannibalism, specifically in the way that it hangs over both the characters and the audience watching them go through these moments. Raven hasn't worried about someone who is hers, truly only hers, in danger for a long time. It is refreshing and loving and it gives hope that nothing else seems to right now. Finding happiness in this time of chaos and between Raven and a guy who admires her this much? He is in awe of her and Raven expresses it the only way she knows how being angry about how much she cares when she shouldn't. This is just one more person for Raven to worry that she will lose, and in this case, this is her person. They have come a long way but there is nothing cuter than these two finding that moment for themselves, kissing and showing us that true love does exist. How did we all get this lucky with not Zeke? Not everyone agrees on that stance of course, with Echo and Murphy visibly not about it still. Murphy's feelings are clearly more about Raven and there's not much that can be said there. It isn't something that Raven has mirrored and the reason is clear. Had Raven wanted to she would have shown interest between friendship, but there isn't a chance that Raven would do that to Emori. As for Echo, there is much more to unload in the case of the character who has relied on Bellamy to remind everyone that she has changed but yet can't seem to grasp that not Zeke can be trusted as well. She did make that big sacrifice and accept him once he sacrificed his life though, so there's that. Not Zeke probably wasn't looking for her approval but it is nice to not think about Echo killing him all the time. The one question that lingers for me is the absence of the space group so far this season. Similiar to Bellamy and Clarke but on a much larger scale it feels like everyone else from space isn't explored as much. The topic of the time jump and the room that it created for real conflict on a character development level is a whole other conversation that needs to happen. For now, though, the basics are that seeing more of Raven, Emori, Murphy, Monty, and Echo is just a reminder of how much they aren't seen. They serve a purpose on a plot level but it isn't selfish to expect more. Scenes like Emori reaching out to Echo are a reminder that this is a group that got their flashbacks sacrificed for the great good of more screentime for present time stories. And yet, now it still feels like there isn't much the space group is doing. They are assisting and appearing when needed for other character's sakes but they don't have a real drive of their own. Not as much as they used to have at least. Bare minimum, Raven, Murphy, Monty, and Echo are all characters that should have more focus because they are regulars within the show now. It is confusing now more than even when we consider how little movement happened for this group, and how much more there could have been. Relationships scratched the surface, but they didn't break the barrier. There is something to be said about a war where there isn't a clear side. Perhaps it is the knowledge that this war isn't longlasting and everyone will shift to the same "side" against a threat that isn't even human anymore. But there is definitely something to be said about the fact that McCreary is, for now, a momentary threat that isn't meant to be in any grey area. 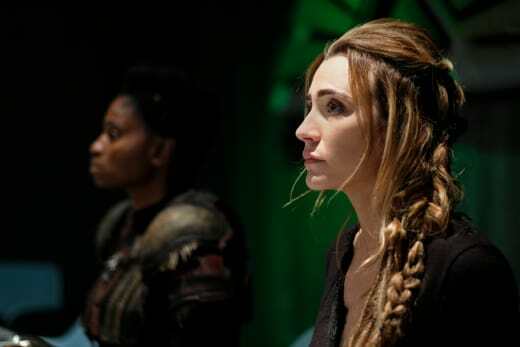 The 100 has consistently circled around villains that aren't just the bad guys, and that is an intricate way to go about developing characters and exploring humanity. But there has to be a point where characters are just evil and there isn't really a reason to explore about how they got there or some attempt to show that they have some good in them. Sometimes bad people are just bad people. Kane, Charmaine, and the space group are all facing that bad person who can't be reasoned with. With access to the bunker, they have that chance to gain a bigger army. But Charmaine is smart, she is beyond smart. This episode was her playing chess with herself because she was trying to outdo what she planned and the suspense has been built. McCreary: Override the loop, I want to know where the hell they are. Prisoner: It took me ten minutes to find rewind. Permalink: It took me ten minutes to find rewind. Giving up their plan to McCreary serves a purpose, but what exactly can it be? They will gain access to the others, with Abby and Kane reunited and probably the space group will be connected in this agreement as well. This means the bunker marching towards them is the one most at risk, and for what? McCreary can't be the big bad of this season, there will be something more which confuses the investment that comes with this war. This isn't about defeating McCreary, he won't be the last battle for them to fight and then live happily ever after from. Which means they truly are about to set up a war that won't achieve too much if at the finish line there are more obstacles. This war is headed towards dangerous territory only because of what can come from it, specifically for Shallow Valley and everyone's survival. Looks like Madi found the shame bell. She is ringing it all around Clarke lately and it isn't like she is wrong. 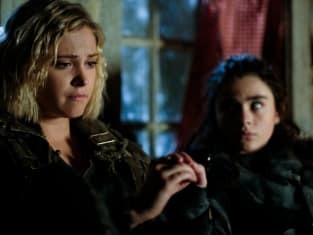 The 100 Season 5 Episode 10 touched on the guilt that Clarke should feel a little, with Madi bringing up yet again that Clarke isn't on the right side of things. There was also that huge issue with Clarke not removing that flame, which was the only reason she reacted the way she did in Polis and left everyone to die. It is clearer than ever that Clarke is in the wrong and she needs to hold herself accountable. 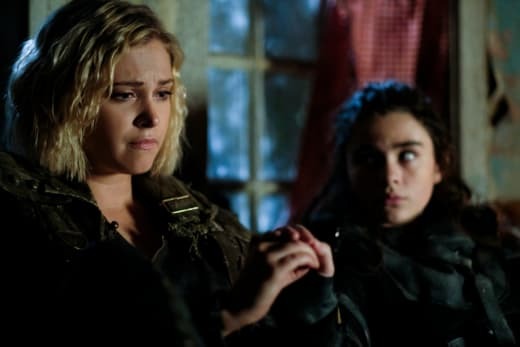 It is so easy on The 100 to forget that stakes can be quite high, with some characters especially this season playing off dire situations as if they are nothing as if they know that nothing will really happen to anyone. Clarke fit into that mold, playing it off as if Bellamy being in the fighting pits was a real concern to his life. Madi serves as a great outside opinion on this because in an overwhelming way she is a piece of Clarke calling herself out. Clarke spent so many years telling Madi stories, all of which have clearly resonated with Madi quite a bit. 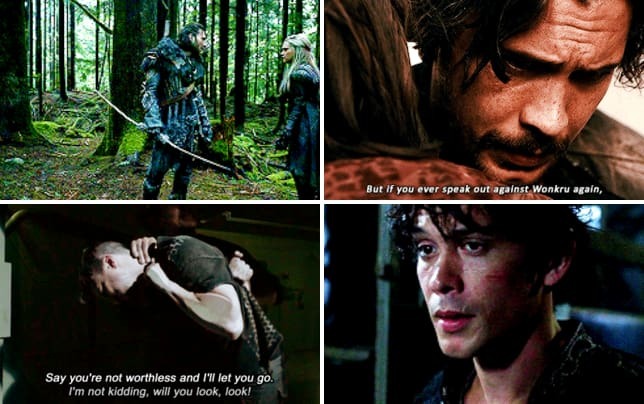 Madi's view of Bellamy and his worth, all of that goes back to what she picked up from Clarke and her stories of him. Through Clarke's view of Bellamy, Madi managed to form her own. 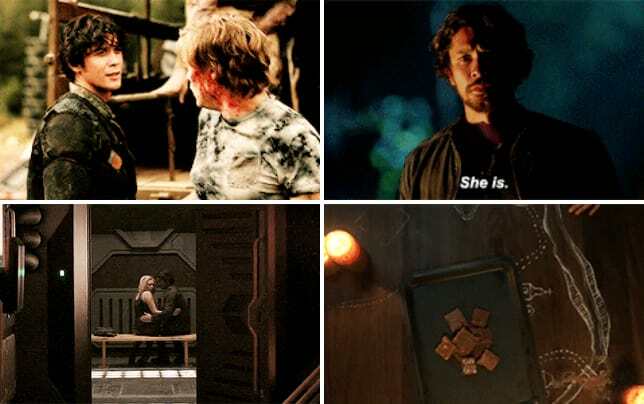 And it is incredibly telling that her opinion of Bellamy is so protective and a weight on her mind even now that they are so far away from stopping anything. I'm not mad at you for saving my life. I'm mad at you for making me care about yours. Understand? Madi fitting this mold of Clarke's consciousness in this situation has especially been a highlight with her. But now she is also reminding Clarke that she is the hero, the one that wouldn't leave Bellamy and the one that now wouldn't help McCreary. Because at the end of the day how is being on the losing side without even blinking an eye a smart move? Clarke is doing this all for Madi, but how is it possible that Madi is safer with this guy than Bellamy and Wonkru. It is a tough choice but that is what this show is built on. The harder choice would have been staying with Bellamy and the others after feeling betrayed, but it also would have been the smarter one for the one person that Clarke cares about. You know, the one that she is trying to protect while still keeping that flame in her. In conclusion, remove the flame. As for Bellamy's side of things, there is really only one thought to have on this. Bellamy and Clarke have been separated from one another this season, both emotionally and now physically, because if they spend too much time together there is really no other direction for them to progress other than the romantic route. Bellamy and Echo are clearly separated this much, during a season where it has to be the exact opposite because if they spend too much time together there is really no other place for them to go other than to break up. It was all too obvious throughout this season as a whole, but also specifically this episode with the way they have been referenced after quite a break once again. It is a stark difference comparing this established relationship to just about any other couple on the show. Abby and Kane, Monty and Harper, even Raven and not Zeke who just got together have circulated around each other much more. But this is really neither here nor there, right? Bellamy got an upgraded outfit and he is killing that desert march game. Such a small shift but still just as great for fans to see their favorite in something that isn't covered in blood yet. Also, it is like his new clothes have given him even more epic dialogue. Good on him. Is anyone else feeling the Too Many Characters Syndrome grasping over the show? While on one hand, it is lovely to have such a variety of characters to enjoy, there is an issue when the lead suffers from it. During The 100 Season 5 Episode 10, Clarke experienced not being the main character in her own show. She had no real story going for her and in fact, she served as a factor in other people's arcs, something that can't continue going forward. This episode reinforced that issue, with main characters of the show taking a back seat to new characters that are great but that aren't the center of our story. The fact that there might still be human remains in those rations worry me. The bunker gave into that, but that doesn't mean the outsiders signed up for this. Why has no one else clued in characters like Clarke, Bellamy, Monty, Harper, and really anyone else who spent even a second around the bunker? Kane and Abby could have warned Clarke before they left or Octavia had the chance to warn her brother to maybe just stick to water? This plot has been in the making since the very beginning, so what exactly is the point of dooming even more people to such a horrific diet. That sequence in the cafeteria will haunt me forever and no one should eat meat ever again. Someone tell Bob Morley that we get it. His use of the family line is prickling away at our hearts and it hurts. Murphy got a gun so clearly everything is fine. It is great. It is not at all frightening. When will Bellamy and Clarke get the bottle episode they deserve? The worry about Echo after The 100 Season 5 Episode 1 still stands. It isn't like she has no role in the bigger picture this season, but yet it still feels like she is tied to Bellamy to accomplish that. For me at least it takes away from who Echo is when she is meant to be favored through her relationship. Independently Echo has come off this time around very strange and not like she is even meant to be liked? She is pitted against characters like Clarke, raven, and Zeke and it doesn't do anything good for how she will be received from that moment on. For a show so known for redeeming less than favorable character, it is confusing how much the ball was dropped in this case. Is anyone else feeling like so much happened but yet not much happened? What did you think of Octavia's decision? What did you think of Abby's decision? Was there any side that you understood more or are you just as conflicted as before? Was cannibalism, in general, the right choice in all this? How difficult was it to watch those flashbacks? Did you even see any of that coming? Do you agree with Madi when she told Clarke all that? Do you think there is finally more room for Clarke to consider where things move from here? What do you think Kane's plan is in all this? Is there any hope for Bellamy and Octavia anymore or did she literally burn that bridge now? Which part did you love the most? Which part did you like the least? How hard are you shipping Pilot Mechanic now that they finally made it official and destroyed us all in the process?